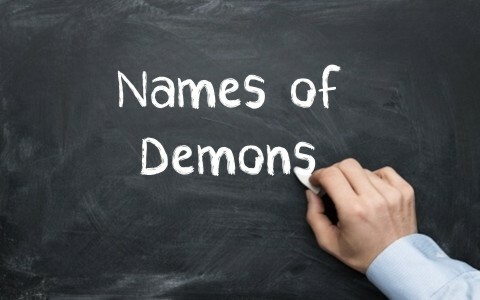 Does The Bible List The Names Of Demons? Does the Bible list the names of demons? If so, what do they mean? Did you realize that when the ancient pagans sacrificed to their “gods,” they were literally making sacrifices to demons? That’s what the Bible teaches about who these sacrifices are actually for. As incredible as it sounds, God connects sacrificing to pagan gods to actually sacrificing to fallen angels or demons. Demons are about 1/3rd of the angels that rebelled with Lucifer or Satan, and became totally corrupt and their every intent was only to do evil, and part of their evil intent was to influence mankind into sacrificing animals to gods which were not gods at all, but even worse, they began sacrificing human beings! This is why there is a connection between sacrificing to pagan gods and sacrificing to demons and this connection is found throughout Scripture. In the Old Testament, in speaking about Israel’s former ways, “they shall no more sacrifice their sacrifices to goat demons, after whom they whore. This shall be a statute forever for them throughout their generations” (Lev 17:7). Apparently, while some of the Israelites were in Egypt, they joined the Egyptians in sacrificing to “goat demons.” Some of these images were found on certain Egyptian hieroglyphics. It is believed that the goat-like appearance of the Devil originates from associations with Pan, which was a horned, half goat, half man pagan god. This could be what Leviticus 17:7 is referring to, but the point is, what they thought they were sacrificing to was not what they really were sacrificing to. Again, God refers to Israel’s former pagan worship by writing that “They sacrificed to demons that were no gods, to gods they had never known, to new gods that had come recently, whom your fathers had never dreaded” (Deut 32:17). In fact, Israel’s idolatry got so bad that “They sacrificed their sons and their daughters to the demons” (Psalm 106:37). Surely the demons delight in this, but God abhors such evil, but of course pagan worship always does that which God hates but the demons love. Jesus was the supreme exorcist because He never failed. Of course, Jesus as God has full authority over everything, including the demons, and they have no choice but to obey His word. In one case, Jesus “came to the other side, to the country of the Gadarenes, two demon-possessed men met him, coming out of the tombs, so fierce that no one could pass that way” (Matt 8:28). These were demons that nobody but Christ could expel, and no human could withstand. Someone that’s possessed has demonic powers, and if you’ve read anything about holy angels, you know these angels have tremendous power, so even the fallen angels are potent forces to mess with. Even so, these demons knew Jesus’ authority over them as “they cried out, “What have you to do with us, O Son of God? Have you come here to torment us before the time” (Matt 8:29), and so “the demons begged him, saying, “If you cast us out, send us away into the herd of pigs.” And he said to them, “Go.” So they came out and went into the pigs, and behold, the whole herd rushed down the steep bank into the sea and drowned in the waters” (Matt 8:31-32). We don’t know their name in this case, although this may be the same event that Mark records in Mark chapter 5, but we know there must have been several demons in them because so many pigs were needed for them to enter into (perhaps hundreds). Of course, they then dived into the sea and drowned. Later on, “a demon-oppressed man who was mute was brought to him” (Matt 9:32) and after “the demon had been cast out, the mute man spoke. And the crowds marveled, saying, “Never was anything like this seen in Israel” (Matt 9:33). This obviously means that none of the Jewish religious leaders could have done this or had been doing this, so these same leaders accuse Jesus of doing this under the power of the “prince of demons,” which of course is Satan (Matt 9:34; Matt 12:24) and is a total lie. Jesus enabled His disciples to perform exorcisms (Matt 10:8), but then there would be a few others who would, unsuccessfully, try to cast out demons. After some itinerant Jews had seen that “God was doing extraordinary miracles by the hands of Paul, so that even handkerchiefs or aprons that had touched his skin were carried away to the sick, and their diseases left them and the evil spirits came out of them” (Acts 19:11-12), some decided to try their hand at casting out a demon, and so “some of the itinerant Jewish exorcists undertook to invoke the name of the Lord Jesus over those who had evil spirits, saying, “I adjure you by the Jesus whom Paul proclaims” (Acts 19:13), and it was the “Seven sons of a Jewish high priest named Sceva were doing this” (Acts 19:14), but “the evil spirit answered them, “Jesus I know, and Paul I recognize, but who are you?” And the man in whom was the evil spirit leaped on them, mastered all of them and overpowered them, so that they fled out of that house naked and wounded” (Acts 19:15-16). These men thought they knew Christ but they didn’t really know Him. That’s why the demons didn’t know them, but if you are known to God, you are known by the demons. That doesn’t mean you should start looking for demons to cast out around every corner or in every person. Make certain you know Jesus (through the written word) and Paul (through his inspired books) before you ever try to cast out a demon. I was only able to find one name of a demon, but it’s not really a name but a description, and that was the name “Legion.” We find this in Mark 5:2-4, “when Jesus had stepped out of the boat, immediately there met him out of the tombs a man with an unclean spirit. He lived among the tombs. And no one could bind him anymore, not even with a chain, for he had often been bound with shackles and chains, but he wrenched the chains apart, and he broke the shackles in pieces. No one had the strength to subdue him,” so this man has such demonic power that he could break chains and not be bound. When the demon possessed man “saw Jesus from afar, he ran and fell down before him. And crying out with a loud voice, he said, “What have you to do with me, Jesus, Son of the Most High God? I adjure you by God, do not torment me” (Mark 5:6-7), again indicating Jesus’ complete sovereignty over them. So “Jesus asked him, “What is your name?” He replied, “My name is Legion, for we are many” (Mark 5:9). A legion is a huge force, as Roman Legions could range anywhere between 3,000 and 6,000 troops, depending upon what century it was. Imagine the power of thousands of demons!? Now, imagine you or me trying to cast out 3,000 to 6,000 demons! For Jesus, it’s just a little word and they’re gone! There is one final reference where Daniel the Prophet wrote about “The prince of the kingdom of Persia withstood me twenty-one days, but Michael, one of the chief princes, came to help me, for I was left there with the kings of Persia” (Dan 10:13) and “the prince of Greece” (Dan 10:20), but these are more titles or positions of authority than they are a personal pronoun or name of a demon. I hope you have found this interesting. I wouldn’t want you to become preoccupied about worrying about demons or Satan. Yes, we should be aware of their schemes and be sure to armor up every day (Eph 6), but we should not fear the demons or Satan, because the prince of darkness was defeated on Calvary and it forever sealed his fate and the fate of his demons, as we read in the Book of Revelation, “and the devil who had deceived them was thrown into the lake of fire and sulfur where the beast and the false prophet were, and they will be tormented day and night forever and ever” (Rev 20:11). That means we are not fighting for victory, but from victory, because Christ has already won the battle. More to read here: Can Christians be Demon Possessed?